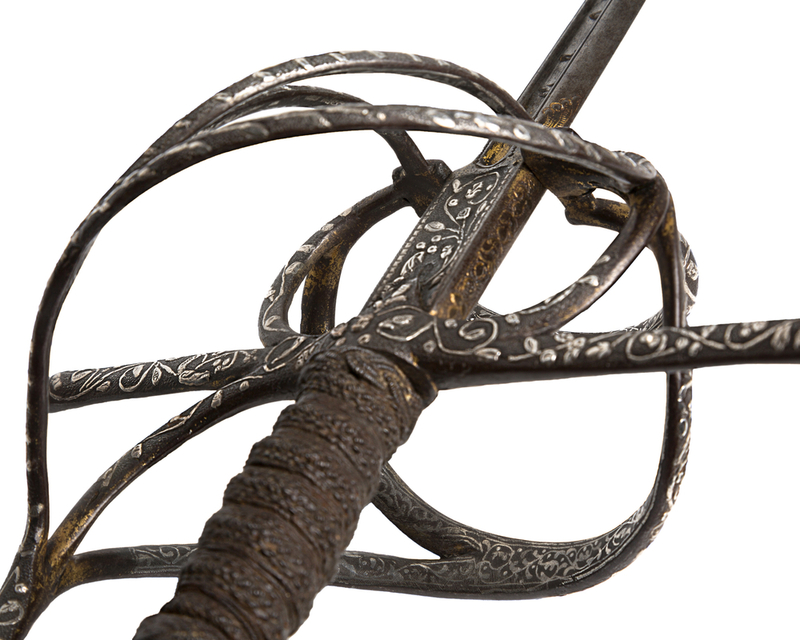 The hilt of flattened oval section comprising straight quillons, two outer rings, the top one joined by a curved bar to the knuckle-guard, the inner guard of three merging curved bars also rising to join the knuckle-guard. 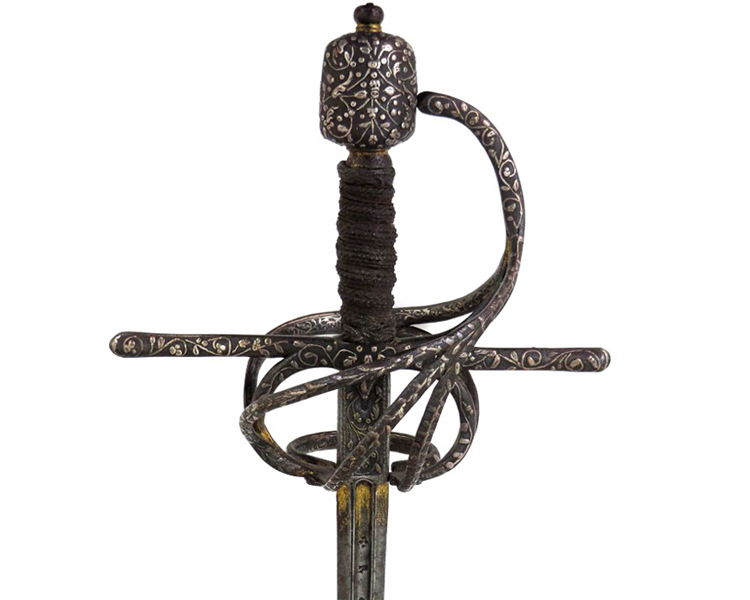 All outer surfaces including the barrel shaped pommel are silver encrusted with human heads set in a vine-like pattern and all on a stippled ground. The entire inner surface of the guard is damascened in silver with a similar vine pattern, which is extremely rare to find. Traces of gilding. 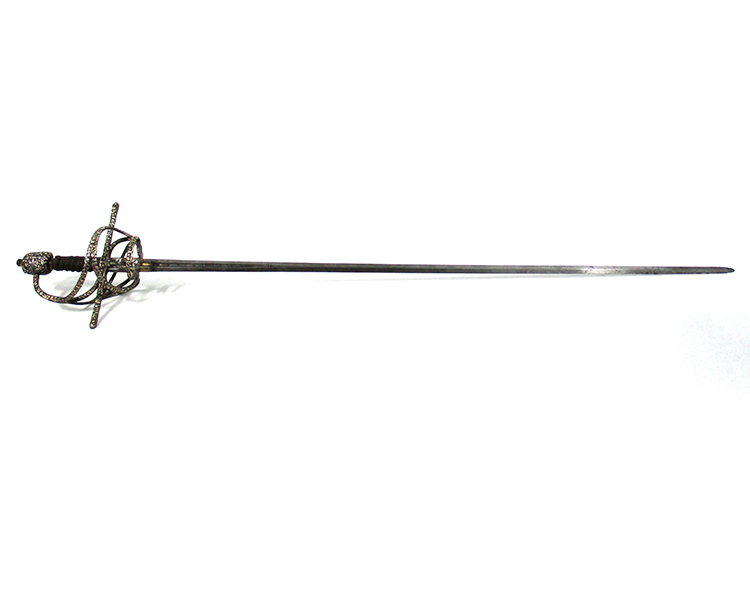 Wooden grip with twisted wire between Turk’s heads. Tapering double edged blade of hexagonal section with a deep central fuller on each face of the forte. The outer fuller stamped “DOMINGO”, the inner “RODRIGUN”. The hollowed ricasso of rectangular section with silver encrustation on a stippled ground, stamped on both sides with a bladesmith’s mark (a crown above a cross over the letter S). The edges chiseled with flower heads and gilded. Guard, pommel and blade in superb condition, original grip exhibits heavy patination.